Phil Booth, right, driving against Paul Scruggs of Xavier earlier this month, will be sidelined indefinitely. 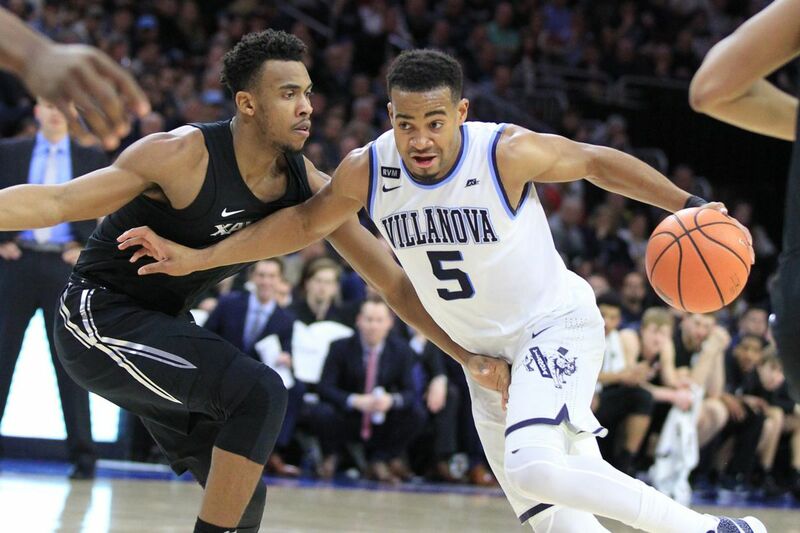 Villanova guard Phil Booth suffered a fractured bone in his right (shooting) hand late in Tuesday night's win over Providence and will be sidelined indefinitely, coach Jay Wright announced Wednesday. Booth, a redshirt junior who missed all but the first three games of last season with a knee injury, had started all 20 games this season. He averaged 11.6 points and shot 43 percent from three-point range, and his 2.5 assist-to-turnover ratio was second in the Big East, behind teammate Jalen Brunson. "All of us are disappointed for Phil," Wright said in a statement. "He is one of our captains, and the respect for him among his teammates is off the charts. Phil is as mentally tough a player as we have had in our program. We know he'll come back better and stronger from this." Villanova’s Ryan Arcidiacono celebrates his teams win with Phil Booth and Mikal Bridges over North Carolina in the National Championship game at NRG Stadium in Houston, TX on Monday, April 4, 2016. The 6-foot-3 Booth, of Baltimore, was the Wildcats' high scorer in the 2016 national championship game, posting a then-career-best 20 points in the 77-74 win over North Carolina. Booth is the third Villanova player to be sidelined with a broken bone in his hand or wrist this season. Freshman Collin Gillespie broke a bone in his left wrist and missed nine games before returning to the lineup last Wednesday against Georgetown. Freshman Jermaine Samuels broke a bone in his left hand on Dec. 27 against DePaul and hasn't played since.